The Potomac Nationals announced Thursday that a deal for a new stadium in Woodbridge is dead, and now the team is looking at other options. WASHINGTON — The Potomac Nationals announced Thursday that a deal for a new stadium in Woodbridge is dead and now the team is looking at other options. Team owner Art Silber told WTOP Saturday that he has already been contacted by several local governments and developers about potential locations to host the single-A affiliate of the Washington Nationals. He would not name the potential locations, but did list a few places the team will likely not be. One was Prince William County, Virginia, since having talks about an alternate location would be difficult, and Silber said there isn’t another location in the county of interest. Another non-contender would be Maryland, since there are already several minor league teams in the state. Silber also mentioned that the team could leave Northern Virginia if a new home can’t be found, however, he would very much prefer to keep the team in the area. So where could the team end up? The City of Alexandria is taking an opportunistic approach to the Potomac Nationals stadium search. “Anything that goes on in the region — from a competitive perspective — we want to be part of that conversation,” Alexandria Vice Mayor Justin Wilson told WTOP Monday. The city staff has been tasked with investigating the possibilities of the team playing in Alexandria and what it would mean for the city. Team owner Art Silber told WTOP Saturday that he had heard from several local governments and developers about hosting the team. Wilson wasn’t sure if Alexandria was one of them. While there is active interest and an active investigation, Wilson would not call it an active pursuit of the team. But, the vice mayor said that there are several opportunities in the city where the single-A team could fit in. Exactly where the team could play isn’t immediately clear either. Despite this active interest, it doesn’t mean the city is willing to throw money at the team to bring them back. 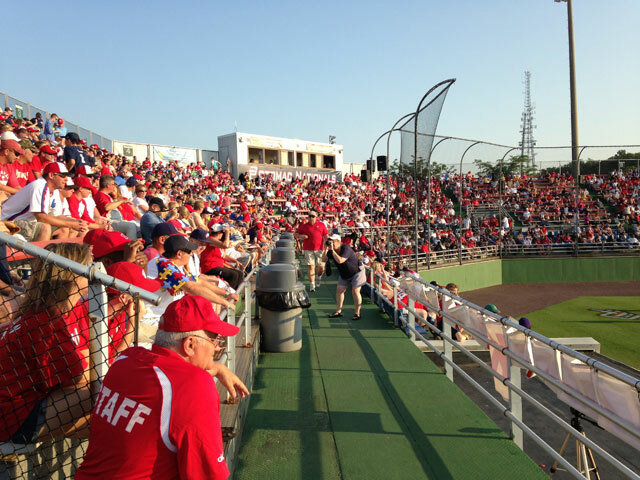 Other Northern Virginia counties have expressed their interest in being open to hosting the Potomac Nationals as well. Wilson said that while he’s competitive and would love to have the team, he wouldn’t be against seeing the team move nearby. Loudoun County has been the center of stadium talks in recent years for both football and baseball. More prominently, the county has been seen as a possible home for a new Redskins stadium, should the team move its home games to Virginia. But there have been ongoing talks about bringing minor league baseball to the county. Loudoun County Supervisor Ron Meyer told WTOP that the county has not spoken to the Potomac Nationals about sites there, but would be open to welcoming the team to Loudoun. With those stadium sites already approved, a team that is not seeking public help could build a new stadium on that land without much interaction from the county government. “We’ve had a couple independent league ballclubs have really serious looks at Loudoun County — we have one that’s still seriously looking at Loudoun County,” noted Meyer, speaking about the ongoing plans for a baseball stadium in the One Loudoun development. Other parts of Northern Virginia have considered building new stadiums for minor league baseball teams in the recent past to no avail. Meyer says things in Loudoun are a bit different from other counties. In terms of income, while Loudoun reigns supreme for top household income, other counties in the region aren’t that far behind with Fairfax County coming in third, Arlington fourth and Prince William 16th nationally. But even with Loudoun remaining a hot market, it doesn’t mean the county is willing to put up a lot of public money to bring in a baseball team. “Having taxpayers actually pay directly into a stadium, I think people are very skeptical of the use of taxpayer dollars,” Meyer said. Regardless of how it happens, one thing is clear: Loudoun wants professional sports. Arlington County says it has no interest in hosting a minor league baseball team. In a statement to WTOP, the county board said there are no discussions about professional sports in Arlington. The county had been an early contender to host the then-Montreal Expos as part of Virginia’s bid to bring the National League team to the Commonwealth. The county board removed Arlington from consideration then, saying a baseball stadium in Pentagon City did not offer enough economic benefit to make it worthwhile for the county. The Expos ended up moving to D.C., becoming the Washington Nationals. Spotsylvania County tried to bring the Hagerstown Suns to the Fredericksburg area a couple years ago with no success. Now, with the Potomac Nationals looking for a new home, Spotsylvania says it hasn’t heard anything from the team. That hurdle is another minor league baseball team. Yakabouski says Spotsylvania is the northernmost county in the Richmond territory for minor league baseball rights, which means if the Potomac Nationals want to move south of the Rappahannock River, they would need to get a waiver from Minor League Baseball. The Suns did so when they considered a move to the Fredericksburg area, which Yakabouski said complicated the process of bringing that team to the area. These hurdles with baseball teams are a reflection of the growing reality about life in and around Fredericksburg — that the region may need to do more on its own for its own benefit. That means commuting up to Northern Virginia and D.C. or south to Richmond is becoming more of a hassle. It also means going to baseball games or other entertainment venues in either city are also becoming more of a hassle. Businesses have already been looking at Spotsylvania, with companies like Lidl setting up operations in the county. Right now, between territorial rights for affiliated baseball and potential costs to the county, it may be a challenge to bring a baseball team to Fredericksburg. Fredericksburg city councilman Matt Kelly called having the Potomac Nationals play in Fredericksburg “a distinct possibility”. The city had talks with the Hagerstown Suns a couple years ago when they were looking to relocate to the Fredericksburg area. Talks with the city fell apart and the team talked to neighboring Spotsylvania County. Those discussions also fell apart. This time around, Kelly said the city still has all of the groundwork that had been put down when they were talking to the Suns in place that could be used with the Potomac Nationals. That includes economic studies, possible sites and even stadium plans. Kelly said there are many possibilities inside the city and beyond city limits it is willing to consider, including some sites in the Celebrate Virginia development along I-95. Kelly said the city wants to build a new multi-use outdoor facility that could host a range of things, including concerts that are already being held in Celebrate Virginia. Adding in a baseball team would just make that possibility a reality even sooner. The issue at this point figuring out what the city and the team each exactly want out of a new stadium. The city needs to determine how much use and control it wants to have on a new facility — and how much it wants to pay for that control. The city wants to hear what the team wants in a potential deal to see if there is any common ground. But for that to happen, the two sides need to meet, which hasn’t happened yet. But Kelly stated that Fredericksburg has a leg up on other locations with its experience talking to the Hagerstown Suns.